I did it again! I did another nail design especially for my sister. For months, my sister has been talking about BioShock Infinite which is apparently the best game she has ever played in her life. Weeks before the release of the game, she made me watch the trailer of the game and I did. To be honest (okay, please, BioShock fans don't throw potatoes at me for this), it didn't strike any chords in me. I found it okay, nothing too exciting. But you could tell by the expression on my sister's face that she was thrilled and anxious for the release of the game. Haha, I think - okay, I know she was disappointed that I didn't share her enthusiasm. Anyhow, the game was released eventually (I'm sure I was reminded of the release date multiple times) and she bought the game and played it and loved it even more. Usually I watch her play games (Assassin's Creed, Batman: Arkham Asylum & Arkham City, Call of Duty, Battlefield, Metro 2033, etc.) and give comments on what I think about the game and my final verdict on whether I would play it or not. But with BioShock Infinite, I didn't watch it at all. It might or might not have to do with the fact that my sister was so engrossed in the game that she finished it in like a day. I only caught the ending aka the credits rolling, ahaha! I watched that clip of Troy Baker and Courtnee Draper (voice actors of Booker and Elizabeth) singing and that's about it. Sooo... I missed out on the best-est game of all time. And I suppose I feel kind of bad that I didn't share my sister's enthusiasm. 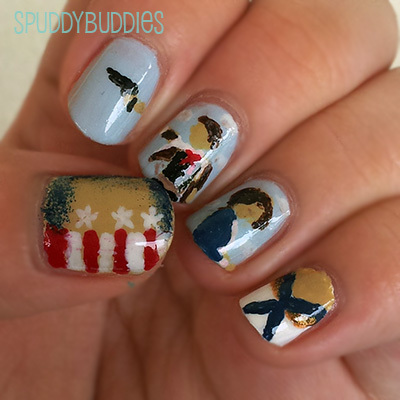 This nail design was spontaneous. I didn't think much before diving into it. I was fresh out of ideas for my next mani - just kidding, I couldn't decide what to paint next. 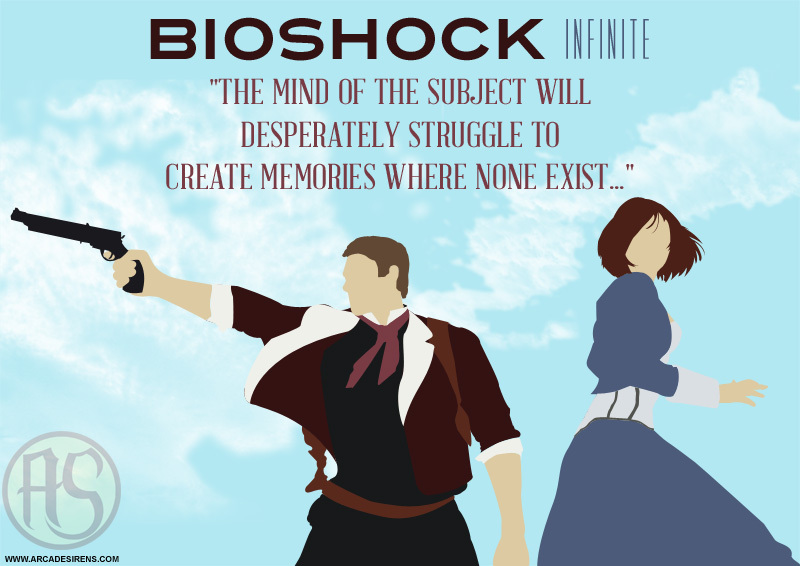 As I was sitting and thinking, the image of BioShock Infinite floated into my mind. My sister was at school so what better surprise than to do nails based on her favorite game?! 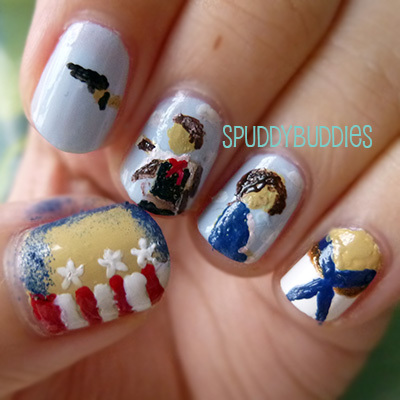 This is before I used top coat so it's a bit gritty and uneven. 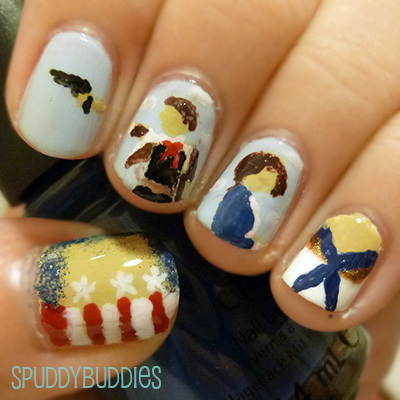 The thumb is the BioShock Infinite title, the index, middle and ring depict Booker and Elizabeth, and the little finger is the front view of the blouse Elizabeth wears in most of the game. Hmm, okay, my Booker is thinner than the picture above and Elizabeth's shoulder should have been higher but apart from that, I think I did pretty good with what I had. Was my sister delighted and surprised? Indeed. 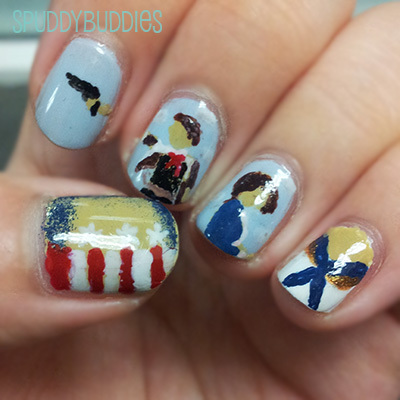 Who would ever guess that I would do BioShock Infinite nails? Certainly not myself so in a way, I surprised myself. Thank you for reading this lengthy post! If you're a BioShock fan or just a fellow gamer and would like to tell my sister how much you also enjoyed the game, feel free to comment or @ me on Twitter. I'll be happy to pass the message along. P.S: As of a couple of hours ago, I can now officially say that I've watched 10% of the gameplay. Yes, my sister made me watch her play it and I agreed. :) Okay, dammit, I like Troy Baker as Booker DeWitt. My sister is going to be ROTFLHAO at this but what the heck, right? P.S.S: I finally get the 'Do you take your coffee black?' reference.